This week, Apple issued a free 7.0.6 update for iOS designed to squash an SSL verification flaw. The update comes less than a month after the 7.0.5 maintenance release targeting deployment issues related to the new launch in China. How was the update reported? Reuters reporter Joseph Menn concocted the now familiar take of crafting a sensational headline scathingly touting the idea that Apple had admitted the presence of a flaw in its software. After five paragraphs grousing about the potential dangers one could imagine (including the quote from a security researcher: "it's as bad as you could imagine, that's all I can say! "), the report finally got around to noting that the flaw had been fixed in the article's sixth paragraph, before returning to the imagined perils of not having the fix installed and how "embarrassing" the flaw was for Apple. If you're keeping notes, every time Apple introduces a patch, it outlines the flaws fixed in the new release. And every time it does this, those flaws form the basis of most media accounts of what just happened. For Apple's releases, the update itself isn't news, but the flaws that were fixed are. When Microsoft released its patch for Windows this week, it was factually referred to as a "non-critical, non-security update to fix a bug in the Windows Update system," rather than being imagineered into a potentially disastrous scenario that envisioned the worst possible consequences for users. Never mind that Microsoft's update wasn't even made available in Windows Software Update, or that a second update that was said only to "resolve issues in Windows" was also not yet even available. Users needed to track down how to install the updates in Microsoft's support website and perform them manually. And if they didn't, they might not get other more serious updates in the future, which is a significant problem. Android also suffered reported flaws this week. Except that, rather than being a potential vulnerability like the flaw in Apple's iOS that was addressed five months after the major 7.0 update was first made available, Android's latest bug was a critical security flaw in Android's WebView, first disclosed 14 months ago. 73 percent of Android users are still at risk from this particular attack by relatively easy to use, widely available hacker tools There is now actually a published tool designed specifically to exploit the flaw via an easy to use framework even the most entry-level hacker can use to attack Android users. The reason that tool exists is that security researchers were so frustrated by Google failing to effectively patch the flaw that they are attempting to force it and its partners into action by laying Android bare. Google released a patch for the live bug back in November as part of Android 4.2, but most of its Android hardware and carrier partners haven't yet made the update available to users. In fact, the update is hard enough to obtain and install that Google currently reports that just 27 percent of active Android users accessing Google Play have it installed. That means 73 percent of Android users are still at risk from this particular attack by relatively easy to use, widely available hacker tools, with a large number of those users lacking any access to a fix. That's a fact that hasn't made headlines like the SSL vulnerability patch that Apple has already made available to all of its iOS users. 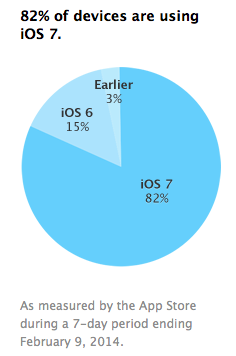 Why does Apple get beaten up for fixing flaws and promptly issuing software updates that are pushed to all users as soon as they are available at a pace so rapid that the company can report that 82 percent of its active users are on the latest version of iOS? By way of comparison, Google's latest Android 4.4 KitKat (originally slated to be named Android 5.0), released alongside iOS 7 last September, has only reached 1.8 percent of Google's active Android users as of this month. Surely such a wide open vulnerability (and one that's fully exploitable by even amateur attackers) in the Android platform is newsworthy, particularly since the tech media likes to describe Google's Android as having 80 percent marketshare among smartphone shipments, rather than acknowledging that Apple earns 87.4 percent of the mobile industry's profits. Perhaps Reuters got tired of writing about Android flaws after noting, two years ago and without much fanfare, that Android was wide open to attack via a published, unpatched flaw that opened users' devices to remote control by attackers. When members of the media do report flaws in Android, Google is quick to jump on reporters with requests that they tone down their stories. But there's another reason for the tech media to treat Apple differently than Google and its Android licensees like Samsung: payola. And there's plenty of evidence that mainstream media sources are willing to slant and distort their reporting in exchange for money, access and favors. The close relationship between Android licensees like Samsung and journalists covering the consumer electronics industry has grown increasingly sketchy. During this year's Consumer Electronics Show in Las Vegas, non other than the Associated Press inked a deal with Samsung that allowed the Korean conglomerate to tweet out sponsored messages as part of the official Associated Press news stream. 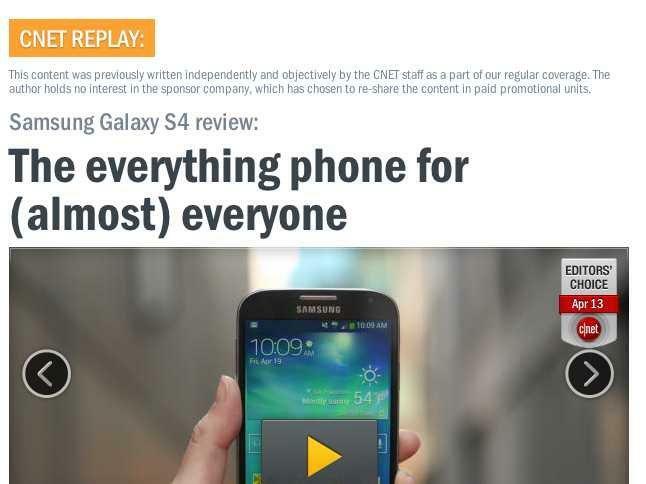 CNET reportedly accepted funds from both Samsung and Microsoft to republish and promote positive reviews of their products, including a gushing CNET "editor's choice" that called Samsung's Galaxy S4 the "everything phone for (almost) everyone." Never mind that Samsung's "everything phone," despite heavy promotion, contributed to only a part of the company's 100 million premium iPhone-class shipments during the same 2013 where Apple sold over 150 million premium iPhones. That makes for a curious definition of "(almost) everyone." Samsung even operates a "Samsung Mobilers" program that selects twenty top bloggers each year and treats them like reporters, giving them official Samsung endorsements and even payments for positive product reviews. The company was investigated for using its "partner" bloggers to slanderously denigrate products from other vendors and eventually forced to pay fines. At the time, Samsung said the "incident was unfortunate," but it appears to fit right in line with its other initiatives to pay for positive coverage, including an embarrassing Fllu viral marketing campaign last summer, phony grassroots viral videos posted to YouTube by an advertising agency pretending to be a avid Samsung Galaxy fan in 2012, and actors passed off as real users that Samsung employed in 2011 at the launch of its iPad competitor. Samsung's favorite source of positive and ostensibly unbiased market analytics, Strategy Analytics, advertises itself as an agency for "influencing consumer behavior and buying preferences." Strategy Analytics regularly generates press releases favorable to Android and Samsung that are republished by the same media sources that accept payment for promotion of positive reviews. 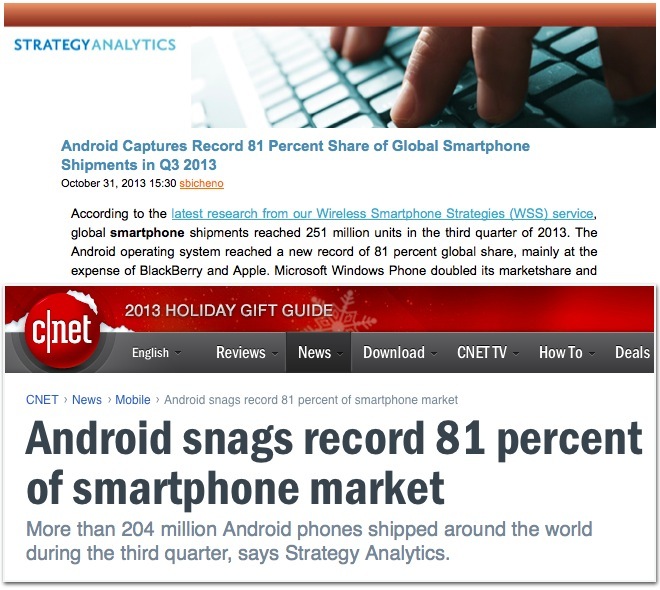 Interestingly, while CNET found it newsworthy to report Strategy Analytics's numbers suggesting that Android had "captured" an 81 percent share of the smartphone market in the September quarter, it didn't see anything newsworthy in IDC's report indicating that Android had fallen from 81 percent to 78.1 percent share over the important holiday quarter. Instead, CNET chose to blend Android with iOS in a headline that told readers: "Android, iOS score 96 percent of smartphone share in Q4 rankings," tacitly observing that mobile devices using Apple's WebKit (rather than Google's Android) make up the world's largest platform, without actually saying that. At the same time, CNET avoided mention of the fact that Android's unit share had noticeably faded by three percentage points during the biggest quarter of the year, despite its shipments being padded with vast volumes of low end, unprofitable devices that contribute very little to the strength of the Android platform in terms of its attraction to developers. Samsung not only pays media outlets to promote favorable coverage, but it also acts to influence the removal of unfavorable reports. During this year's Olympics, Samsung promoted its sponsorship of athletes with instructions that they cover up their Apple logos during the opening ceremony, flagrantly breaking the event's sponsorship rules. A weaselly-worded sort-of-denial issued by Samsung was enough to generate a confident FastCompany headline: "NO, THE OLYMPICS AND SAMSUNG ARE NOT BANNING IPHONES DURING THE OPENING CEREMONY," but that damage control story didn't change the fact that the athletes had in fact been instructed to cover their logos as a condition of receiving a free Galaxy Note 3, even if they shouldn't have been under Olympic sponsorship rules, and even if Samsung wasn't interested in enforcing the "ban" after it was publicized. Another recent incident involved Samsung leaning on Park Jung-kyu, president of the Korean-language NewDaily Biz, to order the removal of an article covering Samsung's efforts to limit the distribution of "Another Family," a movie portraying a girl's death connected to the working conditions in Samsung's factories. The movie gained "attention for being the first South Korean commercial film to be entirely financed by private donations and crowd funding," and was reported by South Korea's Yonhap News Agency as being "a real-life father's quest for truth about the leukemia death of his young daughter who had worked at one of Samsung's semiconductor plants for four years." The film recounts the story of Hwang Sang-ki, a father who spent years fighting "against Samsung and the Korean Workers' Compensation and Welfare Service, both of which deny any link between her work environment and her illness." In the movie, Hwang was given a fictionalized name and the role of Samsung was played by an anonomized company named "Jinsung Semiconductor" in an attempt to prevent Samsung from suing its producers. The name of the film was also changed from its original title, "Another Family," which played upon a well known Samsung advertising slogan. The film's production crew has claimed that attempts to distribute the film have been repressed via Lotte Cinema, which they accused of abusing "its position as one of the nation's leading cinema chains" in the country in order to thwart the film's distribution. The Wall Street Journal wrote that the film "is based on a true story of a working-class family whose daughter went to work at Samsung semiconductor factory, contracted leukemia during her time there and died from the disease in 2007," and notes that, in real life, a Seoul Administrative Court eventually "ruled in 2011 that toxic chemicals at Samsung plants 'had caused or, at least, expedited the illness' of two workers, including Mr. Hwang's daughter." While more than 30 Samsung employees have filed active claims with South Korea's Workers' Compensation and Welfare Service alleging a link between factory working conditions and rare forms of disease, cancer, multiple sclerosis and brain tumors, few have seen their claims honored. At least another dozen have claims on appeal after having their cases rejected by the agency, reported Youkyung Lee for the Associated Press. This January 2013, after a hydrofluoric acid leak occurred in a Samsung plant resulting in the death of a worker, the local government initiated an investigation into the "coverup" of the incident after finding that the company didn't report the matter until ten hours had passed. The incident was only reported as a curiosity among a few tech media blogs, even though the government eventually fined the company for its inaction. Samsung has regularly released similar denials of wrongdoing that the tech media has often taken seriously, even in the face of overwhelming evidence that the company is not telling the truth. For example, despite being caught cheating at performance benchmarks at least four different times within the last year, the company released contradictory statements that flatly denied its well documented benchmark cheats, insisting that it "was not an attempt to exaggerate particular benchmarking results." Samsung also flatly denied copying Apple's trademarked designs and patented features under oath in court, despite overwhelming evidence to the contrary. After subsequently losing its case, it then admitted to another jury that it was not "disputing that the 13 phones contain some elements of Apple's property" and conceded that it owed Apple a "huge sum of money." Members of the media who happen to not like anything about Apple by default are often quick to give Samsung a pass after the company issues one of its flat denials. But such water carrying favoritism simply destroys their credibility as rapidly as it has destroyed Samsung's. In stark contrast, each year after Apple publicly publishes the most in-depth and transparent report on supplier accountability in the industry, the tech media has frequently sought to twist the progress into a condemnation of Apple's efforts to force its entire global supply chain to upgrade their standards for worker and environmental safety, just as the company's industry-leading efforts to issue regular, free software updates are regularly twisted into a phony exposé that describes the updates as being nothing more than proof of the existence of vulnerabilities in Apple's software. 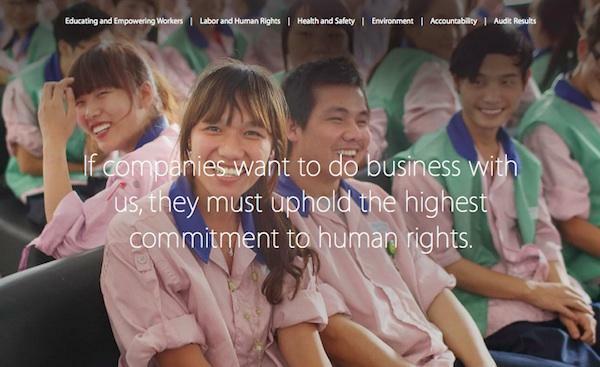 At the same time, Google has never been held accountable for the worker abuse, environmental impacts or the use of conflict minerals that go into Android products, a subject Google doesn't even address. The company couldn't even enforce its own software update support policies under the "Google Update Alliance" that intended to push licensees to deliver regular Android updates, so there's clearly no chance that Google is driving any improvements to employee welfare or environmental issues among its licensees. Google's Android licensees are producing the largest number of low end, high volume, margin scraping electronics devices worldwide, meaning that Android is clearly responsible for driving demand among the most penny pinching, rule bending manufacturers and suppliers in existence. Google's Android licensees are producing the largest number of low end, high volume, margin scraping electronics devices worldwide, meaning that Android is clearly responsible for driving demand among the most penny pinching, rule bending manufacturers and suppliers in existence. That reality has gone unaddressed by major media outlets, including the New York Times. Instead, the paper has castigated Apple in a series of articles that called the company "reprehensible" and "morally repugnant" regarding what Philip Elmer-DeWitt of Fortune described as the "dubious premise that Apple was more guilty than its competitors of such sins as outsourcing work, sidestepping taxes, using patents as weapons and turning a blind eye on labor abuses in its Asian supply chain." It would appear that if Apple wants to rein in the targeted negativity the tech media loves to dish out, it will need to begin spending billions like Samsung to promote tweets, push favorable reviews, pay spiffs as incentives to retail sale promotion and generously ply journalists with free products. At the same time, while all those promotional expenses are allowing Samsung to take the lion's share of Android sales, they don't seem to actually be helping the company make any progress in its battle with Apple over the lucrative high end of the smartphone market, given that Apple continues to sell 50 percent more high end smartphones (and far more tablets) than Samsung does, despite a significantly fewer carrier partners than Samsung. Over the last several years, while Apple has increased its ad spending to a bit more than $1 billion per year, Samsung's annual advertising has ballooned past $4 billion, as Asymco portrayed above. However, Apple's results in profitability are far higher. For the winter quarter, Apple reported revenues of $57.6 billion, quarterly net profit of $13.1 billion and $22.7 billion in cash flow. Samsung reported revenues nearly as large at $55.25 billion, but quarterly net profit of just $7.3 billion and $9.58 billion in cash flow. It appears that Apple's Tim Cook is not only choosing to spend his company's money with more integrity, but is also doing so more effectively. While Samsung pushed 68 percent more phone shipments (unofficial numbers say 86 million phones, versus Apple's 51 million iPhones) and spent much more on advertising and promotion, Apple earned nearly twice as much money in the quarter. That's something the tech media didn't even seem to notice.